The Jicamarca Radio Observatory was built in 1960-61 by the Central Radio Propagation Laboratory (CRPL) of the National Bureau of Standards (NBS). This lab later became part of the Environmental Science Service Administration (ESSA) and then the National Oceanic and Atmospheric Administration (NOAA). The first incoherent scatter measurements at Jicamarca were made in 1961. 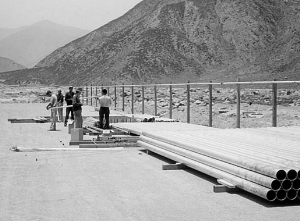 In 1969 ESSA turned the Observatory over to the Instituto Geofísico del Perú (IGP), which had been cooperating with CRPL the IGY in 1957-58 and had been intimately involved with all aspects of the construction and operation of Jicamarca. ESSA and then NOAA continued to provide some support for the operations for several years after 1969 but then phased out their financial involvement. The National Science Foundation then began partially supporting the operation of Jicamarca, first through NOAA, and since 1979 through Cornell University via a Cooperative Agreement. In 1991 a nonprofit Peruvian corporation called Ciencia Internacional (CI) was formed to hire most Observatory staff members and provides their services to the IGP to run the Observatory.